We recently sent out a team of archaeologists and surveyors to record the remains of coastal battery sites along the River Clyde. Ali McCaig explains what they found. 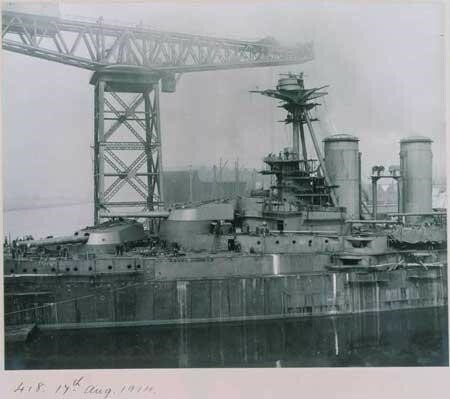 During the First and Second World Wars, the River Clyde was an important port and shipbuilding centre – which meant it had to be protected from attack. We set out to uncover how this was done. The munitions industry and the building and maintenance of warships were vital to the war effort. The Clyde was also a major transport and economic centre on the west coast of Britain, alongside Liverpool and Manchester. As it was so important to the war effort, a series of coastal defences were built to protect the Clyde estuary from attack. The First World War sites were located at Ardhallow, Cloch Point, Portkil and Fort Matilda. A new site at Toward was built during the Second World War and the batteries at Ardhallow and Cloch were modified and reused. 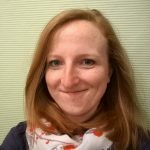 So, how did we start to find out more? Initially, we did some desk based research. This involved studying Fort Record Books held at the National Archives in London. We then set off out into the field to identify and record the surviving remains. We weren’t surprised to find that a number of the structures had collapsed, been removed, or the sites redeveloped. After all, these defences were often built in a hurry out of bricks and shuttered concrete. At Fort Matilda for instance, all that survives are two war department boundary stones marking the limits of the site. Fortunately though, we found much more surviving at the other sites. Portkil battery was the best preserved of the First World War sites. Many of the buildings still stand, including gun emplacements and magazine stores. There are also two fantastically well preserved wooden cartridge lifts. These would have carried ammunition from the underground magazine stores to the guns above. We recorded the surviving remains by taking photographs, mapping the location of each feature and writing descriptions. 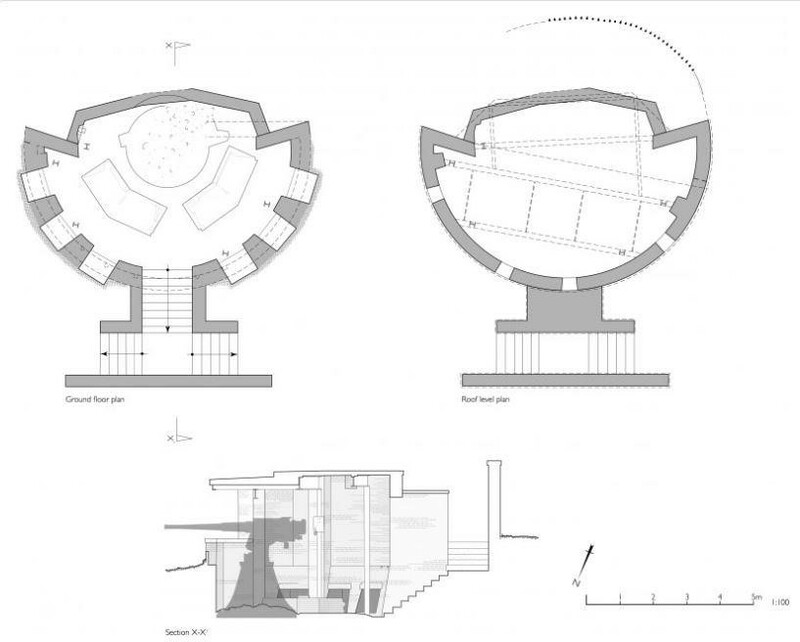 For important or unusual buildings and features, we also created measured drawings. 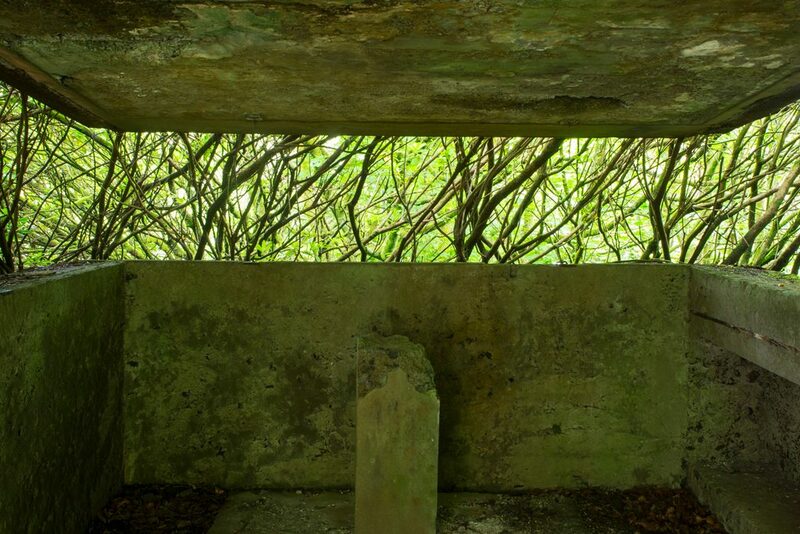 The sites at Cloch and Ardhallow were designed to be well hidden by trees and artificial camouflage. To this day at Ardhallow, parts of the site remain concealed by trees and dense vegetation. 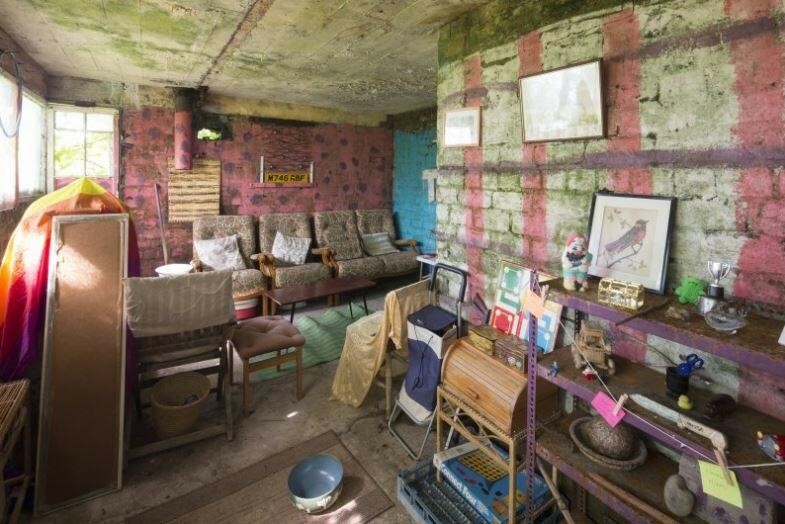 Meanwhile its Battery Observation Post has undergone a different sort of camouflage, as it’s now a rather impressive kids clubhouse! The interior of battery observation post at Ardhallow, now a clubhouse. The rangefinder plinth is concealed by a rainbow flag. 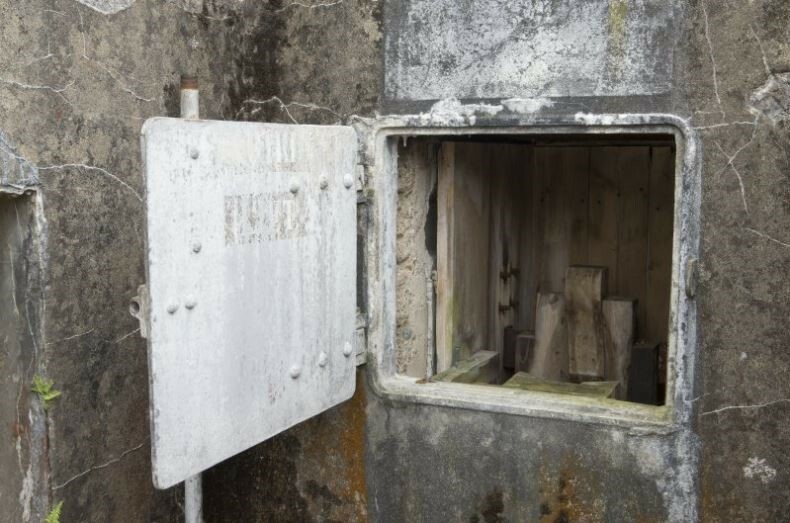 Much of Cloch Battery now lies beneath a caravan site, but the command post buildings survive. We also saw two searchlight emplacements, used to illuminate targets at night. Another surviving feature we recorded was a small metal post on the shore by Cloch lighthouse. It doesn’t look like much, but it served a vital function as an anchor point onto which an anti-submarine boom was tethered. The boom was made up of two parallel subsurface metal nets with surface floats. 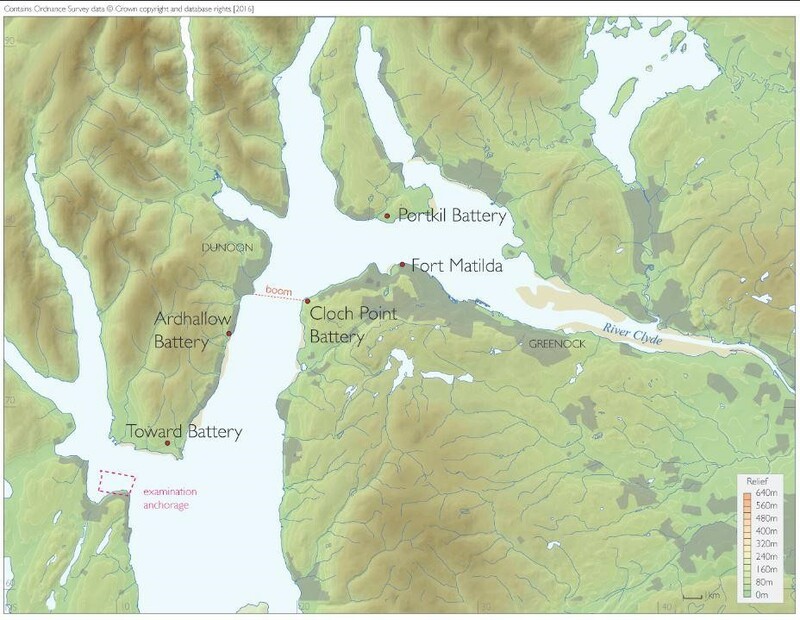 It stretched across to another anchor point at Dunoon to prevent enemy submarines and ships sailing up the Clyde estuary. We were joined at Toward Point by students from the Centre of Battlefield Archaeology at Glasgow University. They helped us photograph and map the site. It is particularly well preserved. The majority of the brick buildings are still standing and evidence of the wooden buildings, such as accommodation huts, are visible as earthwork platforms. These huts would have housed the soldiers who worked in shifts to man the guns and observation posts 24 hours a day. Women also served at Toward and we recorded the remains of two huts for the ATS (Auxiliary Territorial Service), which was the women’s branch of the British Army. Each site also had a network of defences around them. These included blockhouses (pillboxes), trenches and barbed wire to prevent attack from land. We also discovered the faint traces of trenches zig-zagging the fairways of Greenock Golf course. These were part of the Lyle Hill position which defended Fort Matilda. At Toward, we recorded a network of machine gun posts. These survive as grass-grown mounds. 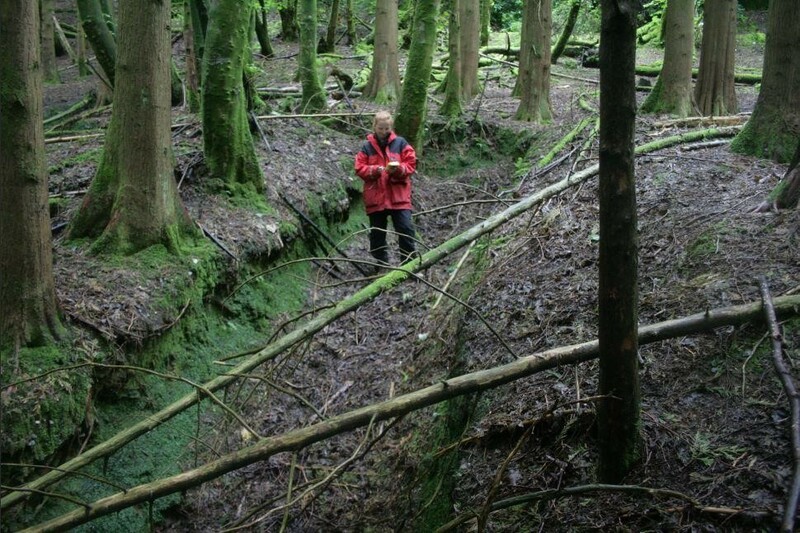 At Ardhallow, we discovered a series of well preserved trenches. Our project has produced hundreds of new site descriptions, photographs, survey drawings and maps. You can explore our findings further by searching the National Record of the Historic Environment – aka Canmore. « A Career in Ruins?